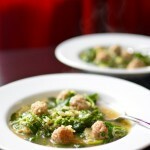 I’m not sure how authentic Italian wedding soup is to Italians in Italy, or if it’s more of an American-Italian dish. At any rate, it’s tasty and easy to make, which were two of the three requirements I had for my lunch today; the third requirement was that it had to be healthy, which I made absolute sure that is was. My need for a healthy meal meant that I had to take a few liberties in my approach to making this soup. Firstly, because of the gluten, I opted not to use breadcrumbs in my meatballs, nor pasta for the soup. Furthermore, I made my meatballs using turkey instead of veal for which this dish is traditionally prepared with. I replaced the pasta with protein-rich quinoa. Quinoa is a perfect or complete protein, which means it contains all nine essential amino acids that our bodies don’t produce and therefore must acquire from the foods we eat. And lastly, instead of fresh spinach, I used frozen because it was such a time saver. You can use fresh, you would need about 6-7 cups. But I love the ease of frozen – no chopping or washing required. You’ll be surprised with how far you can stretch a single pound of ground meat in this soup. I was able to get about 65 miniature meatballs from my batch. That’s incredibly surprising when you consider that I didn’t use any filler or binders like breadcrumbs or eggs; just ground turkey and spice. There is grated cheese in the meatballs, but it isn’t much really, especially when you consider the amount of breadcrumbs that would usually go into this dish. I found this soup is really filling, thanks to the quinoa and the loads of leafy roughage that the spinach provides. It was the perfect, heathly lunch (and dinner) meal for a cold and chilly day here is Berlin. 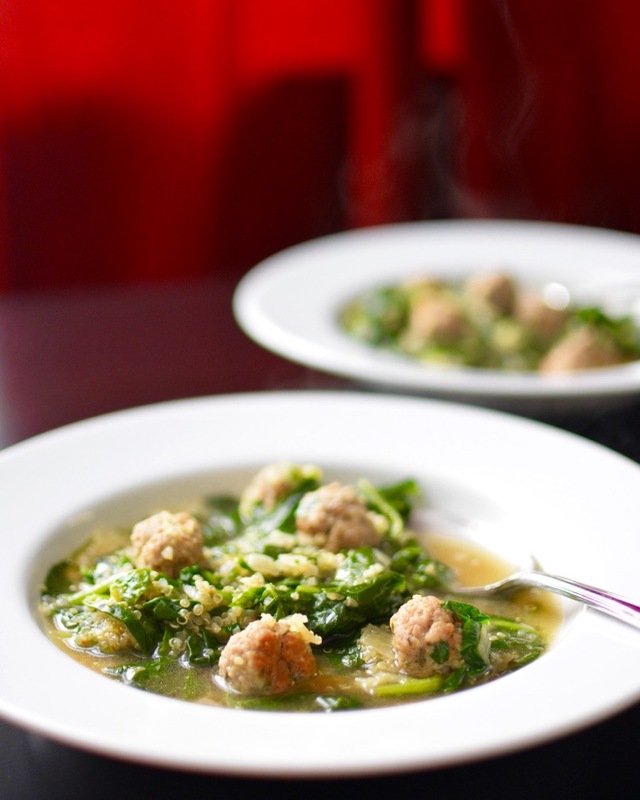 Italian Wedding Soup – My way! Start by making the meatballs. To make them place all the ingredients for the meatballs into large mixing bowl. Using a fork in a sort or flaking motion, combine the ingredients, being careful not to overwork the meat or you’ll end up with tough little marbles instead of tender meatballs. Then, start forming little ¾ – 1” meatballs and place them on a baking tray. Preheat 2 tablespoons of olive oil in a 6-quart heavy bottomed pot over medium-high heat. Brown the meatballs in two batches, returning them to the tray once browned. You needn’t fully cook them, as they will continue to cook in the soup. You need only give them some color and added flavor from browning. Once you’ve browned the meatballs, add the onions to the pan and sauté until slightly translucent, about 5-7 minutes. Then, add the garlic and crushed red pepper. Cook for 1 minute more, then add ¾ teaspoon sea salt, ½ teaspoon fresh ground black pepper and the chicken stock to the pot. Bring the stock to a bubble then carefully add the rinsed quinoa along with meatballs and all of the juices that may have collected in the tray. Once the soup returns to a boil, reduce the heat to low and allow the soup to simmer for about 20 minutes, or until the quinoa has fully cooked. Once the quinoa has fully cooked add the spinach. (I added the spinach along with all the spinach liquid that’s collected in the bowl.) Allow the spinach to heat through, which should only take a few minutes. Taste to check for seasonings and add more salt if necessary; this will depend on how salty your stock was to start with. Serve hot. To make this in advance, prepare everything before adding the spinach. Then, reheat the soup and add the spinach just before serving.